I came across this article about Eddie Jabbour, a 54 year old graphic designer who is on a one man quest to replace the New York City subway map with is KickMap. (via SvN) The current official version tries to stay geographically faithful, but ends up being so complicated it is practically incomprehensible to anyone who hasn't grown up with it. I certainly wouldn't want to have to figure out how to get around New York with nothing but the current map to help me. In contrast, the KickMap doesn't make any effort to accurately portray physical distance but makes it much easier to figure out how to get from one station to another. I think that the issue is one of defining your goals. The KickMap focuses on doing one thing well: explaining the subway system. On the other hand the current official map tries to explain the subway system, serve as a surface map, and show commuter rail and bus routes. Unfortunately, in doing so many things it doesn't do any one of them particularly well. Sadly, the KickMap isn't going to be adopted any time soon. Christopher Boylan, the transportation authorityâ€™s executive director of corporate and community affairs said â€œThe design is important, but the thing weâ€™re concerned with is the best directional guidance. We design a map for use, not solely to look good, and we think it looks good.â€ The irony is that the new map was designed not to be prettier, but because of the usability failures of the current map. In the end it comes down to a question of what the goal for a subway map is. I think that goal should be to navigate the subway system, not the whole city. 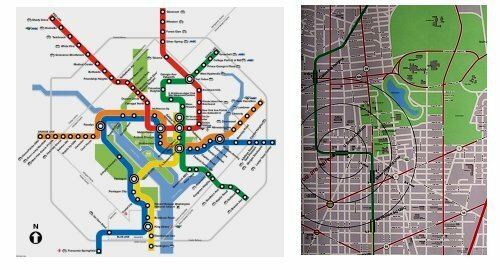 DC's metro map is also somewhat abstract and geographically inaccurate, but it does a great job of explaining the subway system. Each station then has geographically accurate surface maps that show the surrounding area so that you can orient yourself when exiting the subway system. I think this strikes the proper balance. Pick what you want to do, do that well, and provide easy ways to get related information when it is contextually important. This is something we would do well to remember in software development.